Awesome thread, though I gotta say the SSN getting removed bummed me out. It takes more time to fit the tenon like they did in the 50's. 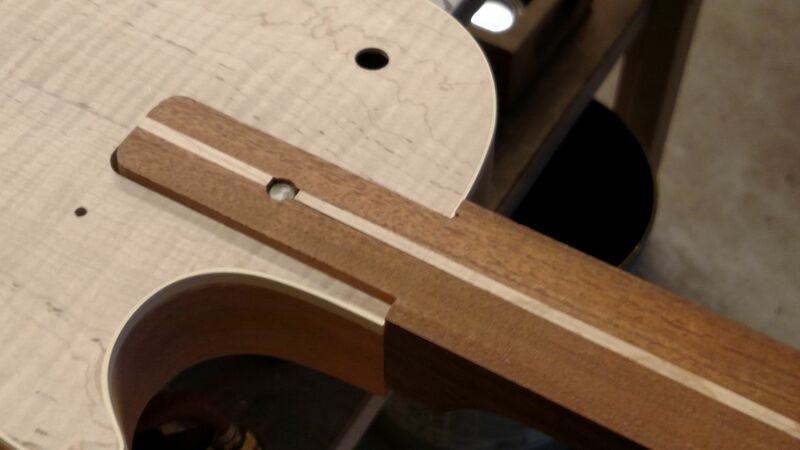 This is how Gibson reissues fits the tenon. They undersize the tenon by about 1/16" then use tightbond glue to fill in the gap. That way there's not much to hand fit the neck. Notice how much glue is on the tenon and in the neck pocket. Doing it this way there is no wood touching wood at the most important joint on a Les Paul. This is NOT how any good luthier would fit this joint. On my builds I allow about .005-.008 just enough so I don't squeeze the hide glue out of the joint. One question here: When Gibson went to hide glue on the historic's, did they do they same process, ..simply filling the gaps with hideglue vice tightbond?